Presence of an extra tooth in the dental arch in addition to the normal series of teeth is called supernumerary tooth. It may closely resemble the teeth of the group to which it belongs, i.e. molars, premolars or anterior teeth, or it may bear little resemblance in size or shape to which it is associated. Supernumerary teeth can occur anywhere in the dental arch, but are found most commonly in the maxilla. The single midline supernumerary tooth is the most common finding. Supernumerary teeth can be classified according to their form and location. Primosch classified supernumeraries into two types according to their shape: supplemental and rudimentary. Supplemental refers to supernumerary teeth of normal shape and size and may also be termed incisiform. Rudimentary defines teeth of abnormal shape and smaller size, including conical, tuberculate and molariform. 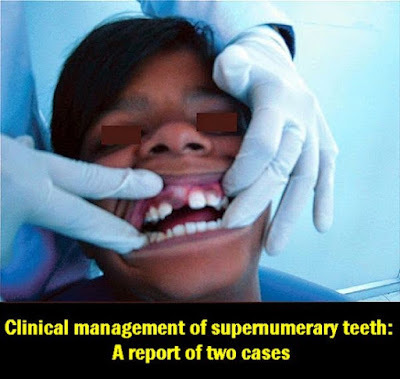 It has been found that approximately 25% of the permanent supernumerary teeth are erupted and the remainder are unerupted, whereas 73% of the primary supernumerary teeth are erupted. Many complications can be associated with supernumeraries, like impaction, delayed eruption or ectopic eruption of adjacent teeth, crowding, development of median diastema and eruption into the floor of the nasal cavity. This may also cause formation of follicular cysts with significant bone destruction and root resorption of the permanent incisors. When any of the above complication occurs or is anticipated, surgical removal of the supernumerary tooth is indicated.